Crossrail’s first TBM, Phyllis, has successfully reached Paddington, having travelled 750m from Royal Oak. A second TBM, Ada, has broken ground at Royal Oak Portal and commenced tunnelling towards Paddington. Over 12,000 segments have now been produced at the Old Oak Common concrete segment plant for the western tunnels. A total of 3,680 segments have been used to construct the western tunnels to-date. Work to install the major conveyor system behind the TBMs will complete once Ada is fully below ground. A total of 24km of conveyer belt will be used to remove excavated material from the western tunnels. Rail sidings have been constructed to allow freight trains operated by GB Railfreight to access Westbourne Park to transport the excavated material to Northfleet, Kent from where it will be shipped to Wallasea Island in Essex to create a RSPB nature reserve. A total of 66,000 tonnes of excavated material has been transported to Northfleet so far. Two kilometres of 900mm narrow gauge tunnel railway has been also laid from Westbourne Park to enable tunnel locomotives to transport materials and supplies into and out of the tunnel. 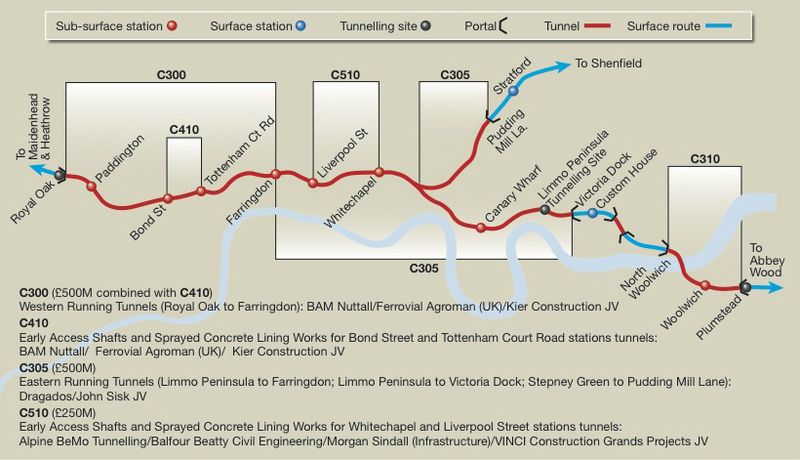 Eight TBMs will be used to construct 21km of Crossrail’s twin bore tunnels running between Royal Oak in west London and Pudding Mill Lane and Plumstead in east London. A further two TBMs, Elizabeth and Victoria, are currently being assembled at Limmo Peninsula beside Canning Town station for the eastern tunnels between Docklands and Farringdon. Tunnelling is due to commence at Limmo Peninsula this winter. A fifth TBM, Sophia has recently completed factory testing. Early next year Sophia will begin constructing the 2.6km Thames Tunnel between Plumstead and North Woolwich.